Does Denny’s provide such a unique product and customer experience that we would be saddened if it didn’t exist? Does Denny’s treat its employees so astonishingly well that those workers would not be able to find another employer to treat them as well? Does Denny’s forge such unfailing emotional connections with its customers that they would fail to find another similar restaurant that could forge just as strong an emotional bond? Does Costco provide such a unique product and customer experience that we would be saddened if it didn’t exist? Does Costco treat its employees so astonishingly well that those workers would not be able to find another employer to treat them as well? Does Costco forge such unfailing emotional connections with its customers that they would fail to find another hardware store that could forge just as strong an emotional bond? If you've enjoyed the "Would You Miss" series on Brand Autopsy, then you'll enjoy Denise's BRANDS WE WOULD MISS series. Denise is riffing off the 24/7 Wall Street article highlighting 12 brands they've singled out as being on the endangered species list. Does Ace Hardware provide such a unique product and customer experience that we would be saddened if it didn’t exist? Does Ace Hardware treat its employees so astonishingly well that those workers would not be able to find another employer to treat them as well? Does Ace Hardware forge such unfailing emotional connections with its customers that they would fail to find another hardware store that could forge just as strong an emotional bond? Does Dairy Queen provide such a unique product and customer experience that we would be saddened if it didn’t exist? Does Dairy Queen treat its employees so astonishingly well that those workers would not be able to find another employer to treat them as well? 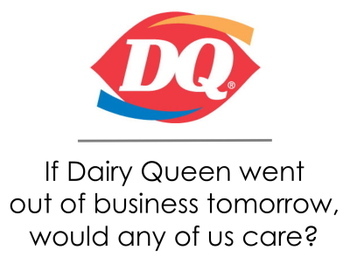 Does Dairy Queen forge such unfailing emotional connections with its customers that they would fail to find another fast food restaurant that could forge just as strong an emotional bond? 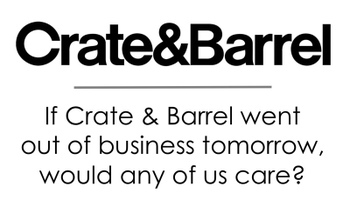 Would you miss Crate & Barrel? Does Crate & Barrel provide such a unique product and customer experience that we would be saddened if it didn’t exist? Does Crate & Barrel treat its employees so astonishingly well that those workers would not be able to find another employer to treat them as well? Does Crate & Barrel forge such unfailing emotional connections with its customers that they would fail to find another retailer that could forge just as strong an emotional bond? Would you miss Dunder Mifflin? Does Dunder Mifflin provide such a unique product and customer experience that we would be saddened if it didn’t exist? Does Dunder Mifflin treat its employees so astonishingly well that those workers would not be able to find another employer to treat them as well? 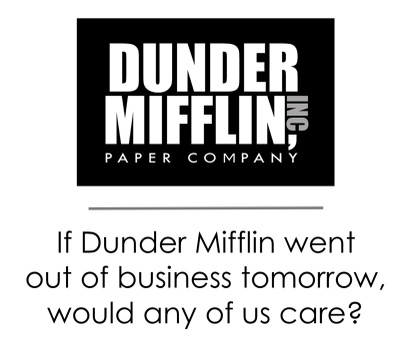 Does Dunder Mifflin forge such unfailing emotional connections with its customers that they would fail to find another shipping company that could forge just as strong an emotional bond? Does BusinessWeek provide such a unique publication and reader experience that we would be saddened if it didn’t exist? Does BusinessWeek treat its employees so astonishingly well that those workers would not be able to find another employer to treat them as well? 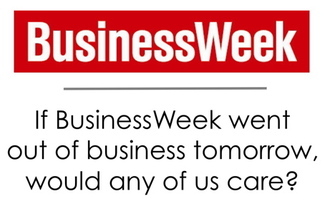 Does BusinessWeek forge such unfailing emotional connections with its readers that they would fail to find another magazine that could forge just as strong an emotional bond? Does UPS (United Parcel Service) provide such a unique service and customer experience that we would be saddened if it didn’t exist? 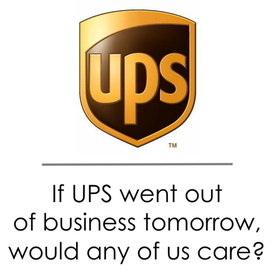 Does UPS treat its employees so astonishingly well that those workers would not be able to find another employer to treat them as well? Does UPS forge such unfailing emotional connections with its customers that they would fail to find another shipping company that could forge just as strong an emotional bond? 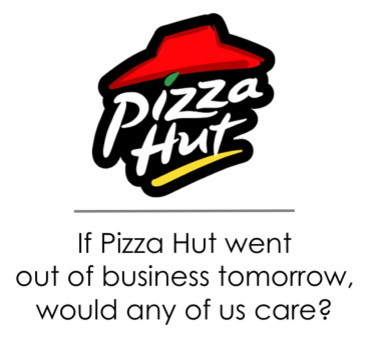 Would you Miss Pizza Hut? Does Pizza Hut provide such a unique product and customer experience that we would be saddened if it didn’t exist? Does Pizza Hut treat its employees so astonishingly well that those workers would not be able to find another employer to treat them as well? Does Pizza Hut forge such unfailing emotional connections with its customers that they would fail to find another pizza joint that could forge just as strong an emotional bond? Does Walgreens provide such a unique product and customer experience that we would be saddened if it didn’t exist? Does Walgreens treat its employees so astonishingly well that those workers would not be able to find another employer to treat them as well? 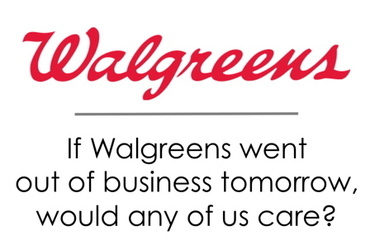 Does Walgreens forge such unfailing emotional connections with its customers that they would fail to find another retailer that could forge just as strong an emotional bond? Will You Miss Polaroid's Instant Film? 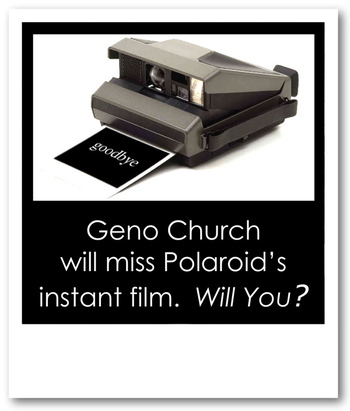 Recently we learned Polaroid will stop producing its instant film for their iconic Polaroid cameras. This was inevitable as the company stopped making the instant camera years ago. The hope is someone, somewhere, will acquire the licensing rights to continue producing the instant film. But that likelihood seems slim given today's digital dominance. Did Polaroid’s instant pictures provide such a unique product and customer experience that we will be sad when it ceases to exist? Did Polaroid’s instant pictures forge such unfailing emotional connections with its customers that they would fail to find another instant camera that could forge just as strong an emotional bond? Does Advertising Age provide such a unique publication and reader experience that we would be saddened if it didn’t exist? 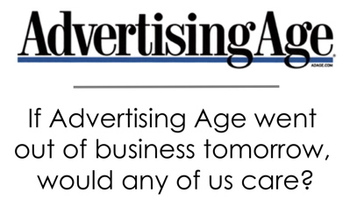 Does Advertising Age treat its employees so astonishingly well that those workers would not be able to find another employer to treat them as well? Does Advertising Age forge such unfailing emotional connections with its readers that they would fail to find another magazine that could forge just as strong an emotional bond? 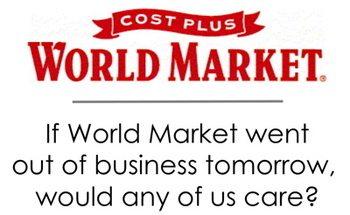 Would You Miss World Market? Does World Market provide such a unique product and customer experience that we would be saddened if it didn’t exist? Does World Market treat its employees so astonishingly well that those workers would not be able to find another employer to treat them as well? Does World Market forge such unfailing emotional connections with its customers that they would fail to find another retailer that could forge just as strong an emotional bond? BACKSTORY | In the book, MAVERICKS AT WORK, the authors included a very provocative question every business must ask itself: "If your company went out of business tomorrow, who would really miss you and why?” That inspired me to run a series of posts in 2007 asking if you would miss a certain business if it went out business. 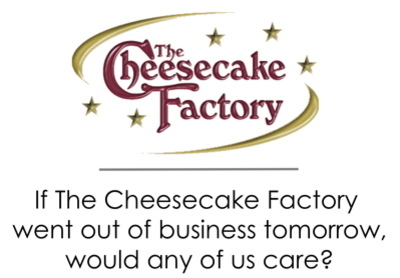 I'm restarting the “Would You Miss” series with a question about The Cheesecake Factory. Does The Cheesecake Factory provide such a unique product and customer experience that we would be saddened if it didn’t exist? Does The Cheesecake Factory treat its employees so astonishingly well that those workers would not be able to find another employer to treat them as well? Does The Cheesecake Factory forge such unfailing emotional connections with its customers that they would fail to find another restaurant that could forge just as strong an emotional bond? 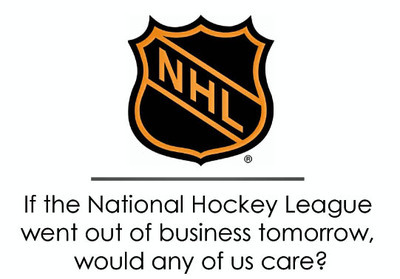 Would You Miss the NHL? Does the National Hockey League (NHL) provide such a unique product and customer experience that we would be saddened if it didn’t exist? Does the NHL treat its employees so astonishingly well that those workers would not be able to find another employer to treat them as well? Does the NHL forge such unfailing emotional connections with its fans that they would fail to find another sports team that could forge just as strong an emotional bond? According to the Wall Street Journal, Chili’s "… is mired in a sales rut and could post its 12th straight negative same-store-sales period this month.” Ouch. 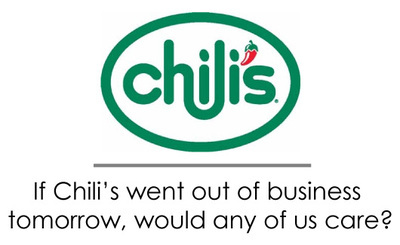 One financial analyst went so far as to describe Chili’s situation as “treacherous.” Double ouch. Can’t say we should be surprised given the surprising HMOs (hot marketing opinions) y’all shared about Chili’s in my “Would You Care” series. Comments ranged from Chili’s being forgettable because they are just another generic casual restaurant to folks saying that they visit Chili’s not for their food, but for their convenience. In other words, Chili’s is boring. And boring is the last thing you want your business to be. UPDATE: Did you know Chili's has a MySpace page? They do. And with it, they give away tickets to their 535,000 friends to super-secret concerts. Heck, even their Secret Shows marketing program has its own MySpace page. Does this make Chili's un-boring? Do the Memphis Grizzlies provide such a unique product and customer experience that we would be saddened if it didn’t exist? Do the Grizzlies treat its employees so astonishingly well that those workers would not be able to find another employer to treat them as well? 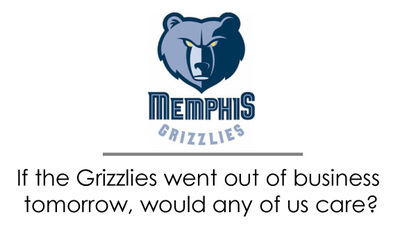 Do the Grizzlies forge such unfailing emotional connections with its fans that they would fail to find another NBA team that could forge just as strong an emotional bond? Does Sears provide such a unique product and customer experience that we would be saddened if it didn’t exist? Does Sears treat its employees so astonishingly well that those workers would not be able to find another employer to treat them as well? Does Sears forge such unfailing emotional connections with its customers that they would fail to find another retailer that could forge just as strong an emotional bond? Does Subaru provide such a unique product and customer experience that we would be saddened if it didn’t exist? Does Subaru treat its employees so astonishingly well that those workers would not be able to find another employer to treat them as well? 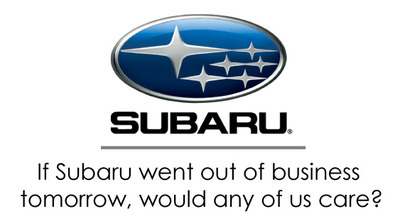 Does Subaru forge such unfailing emotional connections with its customers that they would fail to find another car company that could forge just as strong an emotional bond? Does Chili’s provide such a unique product and customer experience that we would be saddened if it didn’t exist? Does Chili’s treat its employees so astonishingly well that those workers would not be able to find another employer to treat them as well? Does Chili’s forge such unfailing emotional connections with its customers that they would fail to find another restaurant that could forge just as strong an emotional bond? 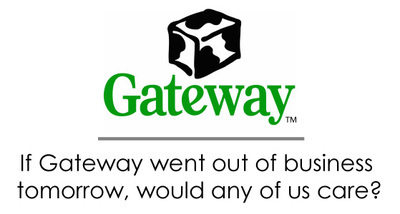 Does Gateway provide such a unique product and customer experience that we would be saddened if it didn’t exist? Does Gateway treat its employees so astonishingly well that those workers would not be able to find another employer to treat them as well? Does Gateway forge such unfailing emotional connections with its customers that they would fail to find another retailer that could forge just as strong an emotional bond? Would you miss Eddie Bauer? In January, I asked you this question: If the Gap went out of business tomorrow, would any of us care? This worthwhile question was lifted directly from the Mavericks at Work book and sparked because of Gap’s sluggish sales and the recent ouster of its CEO. This “would you care” question is a great one to ask of any business because it tells us how well they have formed relationships with customers. If a business has formed unfailing relationships with its customers, then we would truly care if that company went out of business. On the other hand, if a business hasn’t formed a meaningful bond with customers, then we wouldn’t care if that business ceased to exist. Throughout 2007 I am going to ask this “would you care” question of other businesses. Please offer your opinions in the comments section. Eddie Bauer has seen better days. In recent years sales have been slow and its lost relevance. It’s CEO abruptly quit. 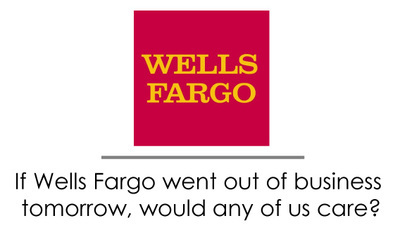 They’ve been in a turnaround phase for years now and recently rejected two buyout offers from private equity firms. Eddie Bauer used to be a relevant retailer. They were once a leading outdoor clothing company but in its attempt to broaden to the brand’s appeal, Bauer drifted into selling casual everyday wear and into selling linens and things for the home. So it’s back to the drawing board for Eddie Bauer. But should Bauer even try to live for another day? Does the company still have cachet with us consumers? Do we want Eddie Bauer to live? Do we need Eddie Bauer to live? Would we care if Eddie Bauer went out of business? Would You Miss the Gap? So … if the Gap (and/or its Old Navy & Banana Republic stores) went out of business tomorrow, would any of us care? Does the Gap provide such a unique product and customer experience that we would be saddened if it didn’t exist? Does the Gap treat its employees so astonishingly well that those workers would not be able to find another employer to treat them as well? Does the Gap forge such unfailing emotional connections with its customers that they would fail to find another retailer that could forge just as strong an emotional bond? In thinking about the Gap, I answered ‘NO’ to each of those questions. The Gap doesn’t provide anything unique. The Gap isn’t ranked as one of Fortune’s 100 Best Companies to Work For. And, the Gap hasn’t forged unbreakable emotional connections with its customers. I wouldn't miss the Gap if it went out of business tomorrow.